Miitomo is ringing in 2017 with a special event. Nintendo has added in a special Golden suit, a Miitomo Drop stage with popular items, plus golden items and 100 daily items in Miitomo Shop. Additionally, you can purchase 6500 coins for the price of 3150. The 2017 New Year event has begun! Why not take this chance to grab some special items? – All Miitomo users will receive an in-app Golden suit! You can claim your Golden suit during the New Year event starting 1/1/2017 at 12 AM (midnight, of course) on the dot! You’ll be the center of attention all year long with this fashionable outfit. – A stage full of popular items in Miitomo Drop! We’ve selected 2016’s most popular items and gave them their own Miitomo Drop stage! There is no candy here, just pure win – so it’s even easier to get an item! Note: This Miitomo Drop stage does not accept tickets. Only Miitomo coins can be used to play. – Golden items now available in Miitomo Shop! 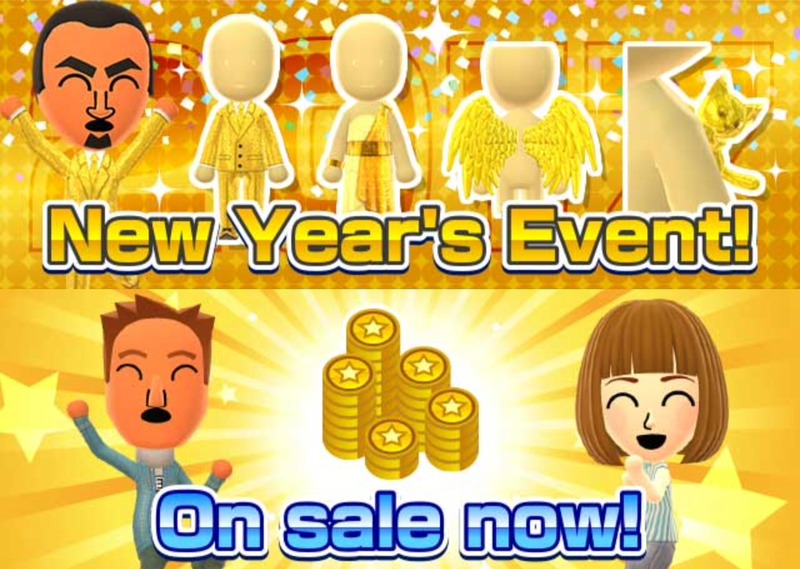 Golden items are available in Miitomo Shop during the New Year event. Why not grab some dazzling resplendent items and start 2017 with a bang? – 100 daily items available in Miitomo Shop! There are more daily items than ever before, with 100 available in Miitomo Shop! Be sure to grab your favorites before they’re gone! – During this event, you can take advantage of a special one-time offer on Miitomo coins. For a limited time, you can get 6500 coins for the price of 3150! Just in time for all those golden items in the shop! Note: This offer is only available to users who have updated to version 2.1 of Miitomo.